Engines: 2x 11 5Ohp Isotta Frasehini eng. In May 1939 Norway ordered eight MTBs from Britain. Four, MTB 5-8, were 60ft Vosper type, built at Portsmouth. MTB 5 and 6 were commissioned by the Royal Norwegian Navy in May 1940, but MTB 7 and 8 were taken over for the Royal Navy in May and became the RN MTB 71 and 72. The Vosper 60ft type were of traditional MTB hard chine form. They were constructed using frames of Honduras Mahogany with topside planking of double thickness mahogany. The bottom planking was of triple thickness mahogany. Powered by twin Isotta Fraschini petrol engines each rated at 1,150 bhp at 1,800 rpm, the MTBs could attain a maximum speed of 39 knots and a steady cruising speed of 35 knots. Each carried about 1,500 gallons of fuel which gave them a range of 450 miles. MTB 71 had a crew of 2 officers and 8 men. The craft were heavily armed with 2 x 18" Mark XI torpedoes in tubes, a twin 0.303" Lewis machine gun mount in a turret aft of the bridge, and 2 x single 0.303" Lewis machine guns on mountings over the torpedo tubes. As with most craft of this size the armament varied during the war. The twin 0.303" Lewis MGs were later replaced by a twin 0.5" Mark V Fraser-Nash power operated turret with 0.5" Mark III Vickers machine guns and the single MGs over the tubes were later replaced by 0.303" Vickers, gas operated machine guns. 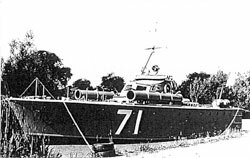 MTB 71 was initially fitted for Asdic and originally had provision for 4 x depth charges, later reduced to two. The craft was fitted with radar about 1942 when the bipod mast was removed and replaced by a pole mast fitted to starboard. MTB 71 was laid down at Vosper's Broad Street, Camber Yard, on 28 July 1939, with the Vosper Yard Number 2019 and commissioned on 2 June 1940. Although Vosper give the hand over date as 5 June, she was not accepted by the Royal Navy until 2 July 1940. She then joined the 11th MTB Flotilla which was based at HMS wasp at Dover under Dover Command. The craft however operated off station including from Portsmouth, on occasions. On the 11 September 1940, MTB 71 was damaged including a fire in her wheelhouse, during an air attack and heavy bombardment of Dover. She was subsequently under repair at Whitstable for about four months which was completed on 9 January 1941. According to a Portsmouth Command action report, on the night of 21/22 June 1941, she was off Etaples when there was an indecisive action where no torpedo targets were seen. MTB 71 sustained slight, superficial damage during the action with enemy escorts and the Petty Officer Stoker was killed. A further action is recorded on the night of 23/24 July 1941, when units of the 11th MTB Flotilla were off Berck Buoy. A large enemy tanker in tow, escorted by three trawlers was intercepted. During the action MTB 71 was holed by a shell, below the waterline, amidships, which resulted in the flooding of one compartment. She was out of action for about 2 months with repairs completed by the end of September 1941. Following her repair on the Thames, MTB 71 joined the 1st MTB Flotilla in November 1941, when re-commissioned, with a Royal Norwegian Navy crew, between 10 November 1941 and 4 February 1942. The Flotilla was under the Nore Command and based at HMS Beehive at Felixstowe. During this period she had brief brush with German E-boats off Kwinte Bank. MTB 71 was handed back to the Royal Navy in early February 1942. She was in action again on 8/9 February 1942 with several other MTBs from a few other flotillas in the Dover Strait, out searching for German destroyers, however the intercept was missed and all returned to port. On the 12 February MTB 71 was involved in the search for the German raiders Scharnhorst, Gneisneau and Prinz Eugen as they passed through the Dover Straits. MTB 71 is noted as being damaged that day by shellfire and then under repair for about six months. She was taken in hand on 24 February at Brightlingsea for damage repairs which were completed on 14 August 1942. The 1st MTB Flotilla was paid off in September 1942 and MTB 71 was nominally transferred to the 4th MTB Flotilla based at Felixstowe. However MTB 71 subsequently was at Portland for some time, awaiting spares, before returning to Felixstowe in November 1942. She was involved in one operation off the Hook of Holland when she was fired on by armed trawlers and suffered damage to her electrical wiring between the bridge and the engine room. MTB 71 was taken in hand for repairs at Brightlingsea on 18 February 1943 and returned to service on 18 March 1943.